adidas Originals collaborates with music visionaries Snoop Dogg, Desiigner and MadeinTYO to release remixed tracks of the iconic song “My Way” by Frank Sinatra in two new music videos on music’s biggest night. As a spinoff to the brand’s recent campaign film “Original Is Never Finished”, adidas Originals continues to push the boundaries of creativity by reimagining their very own work with three musical artists. On the launch of the two new videos, the brand turned to Twitter for a takeover teasing both the songs and videos, which officially led up to the final reveal on the social platform. Reaffirming the notion original is never finished, adidas Originals continues to turn to its creators, inspiring them to redefine the meaning of originality. First launched back in January, “Original Is Never Finished”, delivers a visual representation bringing to life the idea that recreating in your own way will always be entirely original. The film explores the brand’s philosophy, the past empowers the future, through a montage of scenes exploring the rich creative past of all spheres of creativity, music, art, film and even sport. 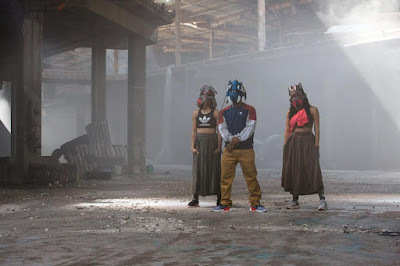 With the release of the two new “Originals Is Never Finished” music videos, adidas Originals hands over the reins of the iconic song “My Way” by Frank Sinatra, to the musical artists Snoop Dogg, Desiigner and MadeinTYO for them to remix it and make it their own. In one video featuring, Snoop Dogg, the rapper and songwriter is captured recording the track within his studio. “I’ve been doing things my way from day one – A1 to Day 1 – and doing things my way is the only way,” says Snoop Dogg. “You need to be connected to the record and give it a second life, and extend the music from its original form.” The result is an original soundtrack remixed by the artist himself. In another video, award nominee for Best Rap Performance, Desiigner, depicts a recreation of the famous painting, St. Sebastian by Sandro Botticelli, giving this iconic work of art new meaning for today’s generation. In another scene, adidas Originals’ repurposed their very own NMD product into masks and MadeinTYO joins a company of masked dancers to perform his original remix of “My Way”. This collaborative video featuring the two artists reinforces the notion that if you push something far enough, it becomes original again. Conceptualized under the creative direction of Johannes Leonardo, adidas Originals’ global creative agency of record, these new music videos and remixed tracks both reaffirm the brand’s philosophy, idea of the past as a canvas to create new ideas. "After opening the conversation with our recent campaign film, we are looking to continue challenging our audience’s idea of originality. By remixing, hacking and handing over our film’s song, we put the power into the hands of the creators, in an ongoing process to prove that "Original is never finished"." - Matthew Edwards, Creative Director at Johannes Leonardo. To release the video and song, adidas Originals took to Twitter, with a take over on the social platform during music’s big night. The artists all contributed to the social chatter posting to their personal channels in support of the reveals. Simultaneously as social media was abuzz with the new video and song, adidas Originals broadcast its brand campaign film “Original Is Never Finished” during music’s big night, further strengthening the notion of what it means to be original.